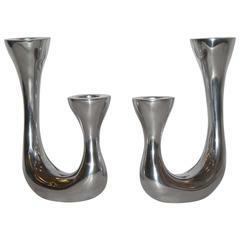 Midcentury Christofle rare design candlesticks, convertible to vases. 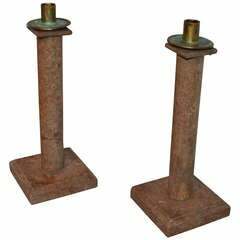 Each of spherical form on long tubular stems surmounted on white marble cylindrical bases. Stems with full Christofle Gallia marks. Nozzles removable to allow for use as vases. Measures: Height 10.75 inches. 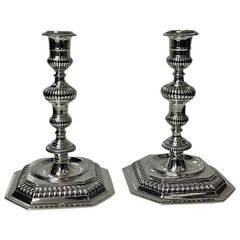 Diameter of candleholders vases approximately 8 inches. 19th century pair of Swedish marble candlesticks with brass candleholder. 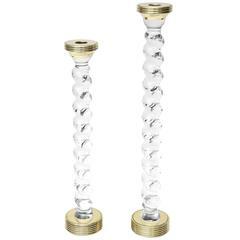 Tommi Parzinger solid brass candleholders made by Dorlyn Silversmiths New York, lacquered brass finish. Signed on each underside.